Is writing a nonfiction book easier than writing a novel? We, the writing team of Writing Tips Oasis believe that writing a novel is different than writing a nonfiction book, but that both are equally difficult. 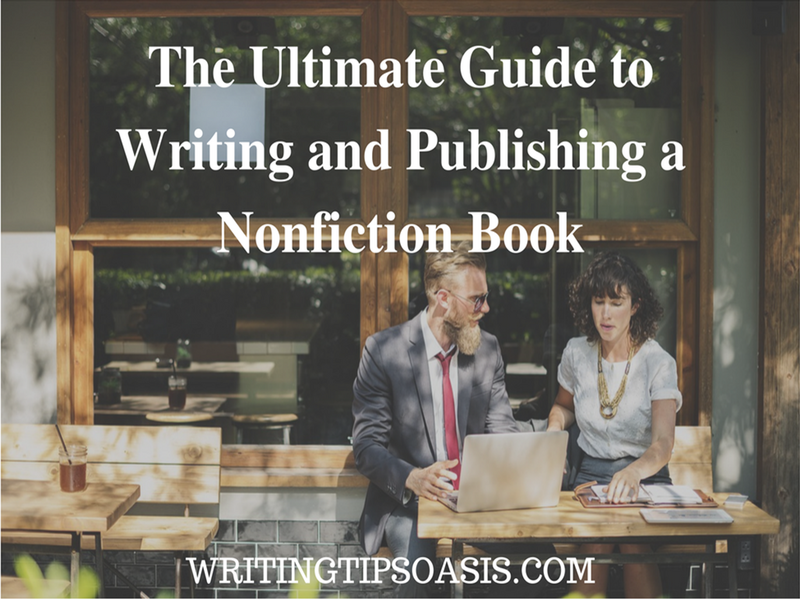 For that reason, we’ve decided to provide you with this beginner’s guide to assist you in writing your first nonfiction book. We’re covering all stages of completing a nonfiction book – from research to writing and publishing the book you’ve written. What you need to always keep in mind is that nonfiction books have a lot of niches – and niches within niches, really – while our guide focuses on all nonfiction books, including memoirs, travel guides, and autobiographies. As a result, you will be able to use the tips and adapt them to your book, no matter which niche you’re writing in. The second thing you need to remember is that writing a nonfiction book can be a very long process, especially since you need to do a lot of research and have amassed a lot of knowledge about the subject of your book. Considering that some nonfiction books have taken years to develop, you must remember to never rush the process. Every bit of information that you present in your book, whether it’s a travel guide or a cooking book, needs to be 100% accurate and supported by facts and references, unless you’re writing your autobiography or a memoir (and even in that case, what you write needs to be the truth rather than an embellished truth). We hope you enjoy our guide and that you find it an immense help when working on your nonfiction book. We have divided our guide into three main sections that correspond to the three phases of publishing a book: planning, writing, and publishing. 9. Who is writing the nonfiction book? The planning phase of writing a nonfiction book is the most important. In this phase, you will be building the pillars upon which your book will stand. The things that you need to do in this phase are not, by all means, gospel, but they have been designed to help you ease yourself into the process of writing your nonfiction book. What makes the planning phase so important? Well, for starters, a nonfiction book relies on a lot of research, a lot of information, and the friendly – or relatable – delivery of the information. So, when you think about it, you will realize that you cannot just sit down and write a nonfiction book about, for example, self-improvement without a plan. What, exactly, do you need to plan? The long answer is not so scary. The audience and what the audience wants. The competition: never assume that you have the most original ideas. The market: are there too many books in the same category/niche? This means that you need to do research, not only on the topic of your nonfiction book, but on the market as well. All of this takes time, true, but you will end up with a book that has original ideas (or, an original spin on already established ideas), compelling content (content written in a gripping manner), and content that helps the readers solve a problem. If you manage to be entertaining in the presentation of your content – even better. In each part of this guide, you will learn how to achieve the maximum potential of your nonfiction book, even if that means that the process of planning, writing and publishing your nonfiction book will take longer. What’s a ‘goal of your book’? The above term might be a misnomer – especially since you might have different reasons as to why you’re writing the book. But, the truth is that every book, even fiction novels, needs to have one important goal – to help or aid. Fiction books, memoirs, and other books (which are not primarily ‘how to’ books) help the readers by providing a distraction, a means of escape, and entertainment. Novels, memoirs, and biographies take the readers on a journey – sometimes a metaphorical journey, other times a physical journey – but a journey nonetheless. Other nonfiction books, like cooking books, travel guides, self-help books, have it the other way around. These books’ intention to help is more direct, compared to the types of books we mentioned above. However, all of them have the same goal – to help the readers solve a problem. The goal of your nonfiction book should be to help people. This means that if you’re writing a travel guide, not only should you write about your favorite places, you also need to provide useful information as well. The same thing stands for writing a self-help book, and even a cooking book. Once you understand this, you will realize that writers never write for themselves – even when they say they do – because all of us write for the audience. You write for the people who will get to read your book. The second part, of course, is to define how your book will help. Will it help by providing advice or facts? Will it help as a guide, or just provide information in general? By defining these things and answering the questions above, you will ready yourself to proceed to the next level – which is defining the topic of your book and the niche it belongs to. Once you decide who you’re going to help – students, parents, seniors, middle aged people, people who have experience in travelling, people who are traveling for the first time, beginners in your field or experts – you’ll be able to move on to defining the topic and niche. You will notice that we’re not talking about type of nonfiction book, but niche. That’s because, as we already mentioned earlier, today, we have niches and niches within those niches. Niche is the term used to define a certain specialization of a topic – for example, if you are writing a travel guide, the travel section will have different niches. Another example is cooking: there are many different books about different cuisines, hence, there are many different niches, and with that, different opportunities. Why is defining your niche important? Because you need to know your competition. Once you know to focus on one niche, you can find other books in it, and read the reviews. Read all reviews. Read the positive reviews as well as the negative, and pay attention to what the readers have found to be good about the books, and what they have disliked as well. Another thing you can define is whether the market is overflowing with books in the niche. For example, you can take a look at the period when the books are popular (Christmas, spring, summer, etc.) or whether there have been too many books published recently in the same genre. You can use this to determine when you will publish your nonfiction book, which can be really important if you’re self-publishing the book. On the other hand, if you have a blog, or another kind of online presence, and have a lot of followers, you should still define the niche, but you would not need to wait for a certain period to publish the book. Once you start reading reviews, you can proceed to define your audience. There are many different ways to research your audience, but looking at reviews of other books within the same niche is the best way to discover what the majority of your target audience wants to read. This can help you define the goal of your book better, and as such, it will also be very helpful in the writing of the book – because you will know which approach to your topic and what type of writing style will “speak” better to your audience, which in the end, is the ultimate goal – to please the readers. Another way to research your audience is to take look at the most prominent keywords in your niche and category. Researching the most prominent keywords is very easy and it can help you adjust the title of your book in order to reach as many readers as possible. If you go to Amazon and search for cooking books (or just do a Google search on cooking books), you will get search results. These results are directly connected to the keyword you used. It shows you what the readers will find when they search for cooking books. The words from above will probably change as the market changes, and by the time you are reading this, different cooking books will be more popular, and as such, different keywords. However, it’s very easy to determine that there are different audiences out there for different cooking books. Some readers like easy to make recipes, other readers, vegans and vegetarians, want to cook their own food. The different types of audiences within the same category are what make a niche in the market. Another way to do keyword research is to pay attention to the suggestions that come up when you start typing a phrase. For example, if you type in “easy cooking” in Google, a suggestion that comes up is “dinner recipes.” This shows you that there are people looking for easy dinner recipes, rather than easy exotic recipes, and so on. You can use this research when you brainstorm for the title of your book. Then, you can create a title that will make sure your book comes up in the search results of the majority of your audience via the search engines. You will know if the things you will present in your book have already been talked about in another book. You will get to see what other writers and experts in your niche are writing about the most – and whether you can bring something else to the table. Put yourself in your readers’ shoes: what do you like and dislike? Use the other books as research. Why not? Nothing is new under the sun and we all love to think of ourselves as experts in our field, especially if we are very passionate about it. However, there is a lot of knowledge out there, and you never know where you will find new ideas that you will be able to explore. Never steal ideas or writing from other books as your own. If you learn something new during your research, then present it as such and tell the readers where you learned it from. If you come across exercises or methods that you would like to share with your readers in your book, try them out for yourself first, and then share the experience. Moreover, make sure that you’re never called out for plagiarism – even if you did not plagiarize anything from other writers, the sole stigma of the accusation will mar your reputation and it might take you years and years, books and more books, to clear your name. There are more benefits from reading books in your niche, but the ones we mentioned above will help you write your book. Even if you are getting someone else to write it for you (more on that later), the benefits are even greater – because you will be able to provide the other person with many details and research material. This is a very interesting step that almost no one thinks about. What would style have to do with anything? Well, style is very important because it can put the content of your book in a different light. Another element is tone: what will be the tone of your book? Will you write in a friendly manner, or will your book be written in a professional tone, or academic style, or in a serious tone? Lately, many nonfiction books, depending on the niche of course, are written in a friendly, conversational manner that speaks directly to the readers. This is especially important if you’re writing a self-help book. Writing in a stern tone might alienate your readers who genuinely need help and would not feel comfortable reading books where the author’s voice comes across as stern instead of kind. The style of your nonfiction book will depend on three things: the topic, and by extension, the niche, and what your readers would prefer. Ultimately, if you will be writing your book, you need to find a writing style that you’re comfortable with. However, that doesn’t mean that you couldn’t make adjustments. For example, if your topic requires a friendlier voice, then you can try to adjust your writing to it. Writing a nonfiction book is a difficult feat, but it can also be a long one. That’s why we wouldn’t advise you to do a complete research of the topic before writing the nonfiction book. In fact, what we advise is to be constantly on the lookout for new information. Never stop researching the topic while you’re writing and editing your nonfiction book. Of course, this doesn’t mean that you will be able to amass all knowledge about a certain topic or place in a single book, however, when you do research every day, you will at least make sure that the knowledge you share is up to date. This is especially important in nonfiction books like travel guides – if your information is at least a year old, then the guide wouldn’t be very useful, would it? This is the reason why nonfiction books often take longer to write than fiction – when it comes to fiction, the writer tells a story, and it doesn’t matter if he thought it today or five years ago. But when you’re publishing a nonfiction book, sharing information that’s outdated – or even worse, proven to be wrong – now you have a problem. Your credibility as a professional in your field will be brought into question – and so will your future career. That’s why you need to be constantly on top of new developments in your field, and you need to always be 100% certain that the information you share is correct. While you’re writing your book, you will need to keep all your research at hand. In the old days, this meant a desk full of papers, other books, little post-it notes with important reminders, index cards, stacked together or strewn around everywhere. In other words, it meant chaos. However, we live in the digital era, and in this digital era, writers have the benefits of software. One such software is Scrivener. Scrivener is a writing software that instantly became a hit among writers due to its sheer usefulness, for both fiction and nonfiction writers. However, when it comes to writing nonfiction books, Scrivener is a golden tool. It allows you to keep your research at hand while you’re writing the book, so whenever you need anything from your research, you can pull it up easily. There will be no looking through the mess of your desk to find what you need, and there will be no need for you to keep open tabs on your browser, because Scrivener helps you keep that information directly. There are more benefits for writing a nonfiction books with Scrivener, and we will be referencing them in their relevant section. An overview of the interest your book generates among traditional publishers. Feedback – which you will get if you send them both a pitch and a sample of your completed manuscript, after you’ve completed it. They say that it is very rare that traditional publishing houses specializing in nonfiction will sign a book deal with a previously unpublished writer; however, they also say that writers need to be both good and lucky. So, you never know which opportunities might arise from sending out a proposal to a traditional publishing house. Also, if you already have a fan base of followers, the chances of a traditional publishing house choosing your book are bigger. For that, however, you need to draft a good proposal. Always make sure to mention the fact that you already have a platform of followers (if you have any). Explain, in a professional manner, all the benefits the readers will get from your book. Choose the right publishing house – don’t send an academic publishing house your new book about self-help, for example. As we keep mentioning, both here and in our other guide for writing fiction, self-publishing is a very good opportunity for many writers and experts in many fields. A lot of nonfiction bestselling authors, like Steve Scott, are actually self-published, and some were self-published before they got a publishing deal. Many of them also had a big online presence via their blogs and social media. There are also writers who decided to self-publish instead of publish the traditional way, as was the case of Anthony Hayward. If you don’t have a blog – start one. It can be expensive, sure, but you need to have an online presence before you publish a book, especially a nonfiction book, to establish yourself as an expert on the topic, and to attract followers who will later want to buy your book. The above means also having social media presence – again, not a personal presence, unless you mean to use your name as your brand, rather than something else. Make sure that your book goes through extensive editing and proofreading to catch any mistakes. Make sure that the cover of your book includes a good cover and an attractive blurb. Include a professional photo of yourself – not an amateur selfie, but a professional photograph, as well as a short, but detailed biography of yourself. It’s preferable to publish an e-book before you self-publish a print version. Publishing an e-book means that your book will be available in almost all parts of the world. Comparatively, if you self-publish in print, your outreach will be limited to only one country, and depend on bookstores and other means of distribution. On the other hand, if the majority of your intended audience prefers to read physical books and lives in your home country, then you can go for self-publishing in print. However, keep in mind that self-publishing in print can be really expensive and you might end up with a lot of unsold books gathering dust in your home. The above mentioned tips are relevant for all nonfiction books, regardless of the topic. Even if you’re writing about humor, you need all of the above to ensure your book shows the readers that you’re a professional and that your book is offering them a great amount of knowledge. Once you’ve completed all of the steps in the previous section and adapted them to your book and your purpose, you can proceed to phase two – writing the book. In this section, we will talk about the actual writing of the book, and how to overcome the problems you may have during this period. There are many ways and methods of writing a book. Some writers (and some time management experts as well), will tell you that you need to define a certain daily writing goal. This writing goal can be to write for two, three or five hours, or to write at least 500 words in a day. However, if you’re not comfortable with the act of writing, then you have a problem. On the other hand, even writers aren’t always comfortable with the act of writing. They hit writer’s block, they have days when they would much rather pull out their nails rather than write. That’s the first thing you need to decide, especially if this will be your first foray into writing. Another reason why we suggested setting up a website – a blog – where you will start sharing some of your knowledge during the planning phase, is the fact that writing a 50,000-word book might be a difficult feat for someone who has not developed the habit of writing daily. Having a blog, on the other hand, will ease you into the act of writing daily, and when you’re ready, you can start writing the book. However, we strongly urge you to get a ghostwriter to write your book if you’re facing problems, or if you simply wish to focus on different things related to the publishing process. Even if you do have a blog that you update every day, writing a full length book is a daunting process, and you might feel more comfortable if someone else does it for you. It’s always better to pay a bit more for a ghostwriter who has experience. Create a test task for the writer before you hire them. Ask for a definite turnaround time: you don’t want to hire someone to write your book and then, after months pass, discover that nothing has actually been done. Ask for weekly or daily updates. Look for a ghostwriter who has already written other nonfiction books in your niche. Look for bloggers in your niche – many of them advertise the fact that they’re ghostwriters on their blogs. Look for a ghostwriter who has a positive rating and, if possible, ask for feedback from the ghostwriter’s previous clients. Always be transparent in your communication with the ghostwriter – and ask for the same in turn. It’s always better to have a detailed outline before writing a nonfiction book because you can use it as a guide during the writing the process. You will know, in each moment, what you have written so far and what you still need to write about, at a single glance at your outline. The outline you develop should show you how the book will be divided: whether in parts and chapters, or just chapters, and you can add small comments under each chapter title about the things the chapter will focus on. You can also plan if you will include images or tables, or other illustrations, and where you will include these in your book. During this step, the biggest help for you will be your research – if your research was detailed and extensive, then creating an outline for your nonfiction book will mean organizing all the information in order to present it in a comprehensible way. If you’re writing a how to book, this is even easier, because you will need to write step by step instructions, and each step will lead to the next. The best thing you can do is brainstorm a very detailed outline. Then, you can use the outline to create the table of contents for your book, but your initial outline doesn’t need to be the final version of the table of contents that will go in print. In other words, it doesn’t need to be perfect – it just needs to be useful. So, even if you end up with a table of chapter headings, subheadings, bullet points and numbered lists, with many details and notes in between, it’s okay. Your outline is your guide, and the more details you put in it, the easier it will be for you to write your book. You can come up with a title for your book at any point during the writing process. You might have come up with a title before you began writing your book, you might come up with a title as you’re writing the book, or you might wait for inspiration to strike with the perfect title. However, you can also brainstorm the title before you begin writing the book – but after you’ve finished your outline. Why? Because your outline – your guide – shows you what your book will be about, and what type of problem it will solve for the readers. Then, using keyword research, you can come up with a title that’s catchy, attractive, and promises helpful content. Also, if you use the most prominent keywords in your category, the title will be optimized in such a way as to ensure your prospective readers can easily discover your book with nothing more than a Google search, or an Amazon search, once your book has been published. When it comes to the act of writing, every one writes differently. The goal is to find a way to write that’s comfortable to you. Using your outline as a guide, you can set up a schedule, and daily or weekly milestones to keep the process going. However, you must remember that the writing process is unpredictable, first, and everything else second. When you have a good day, you will overdo your daily goal. This doesn’t mean that you shouldn’t write the next day, but keep going instead. Once you’ve started writing the book, you need to keep going, keep writing, every day, because otherwise, you may face some negative consequences. It may take you a lot longer to write the book than what you’ve originally planned, which will delay the publishing process, regardless of whether you’re self-publishing or not. Provide the ghostwriter with all of your research. Create a very detailed, very descriptive outline. Make sure to let the ghostwriter know what to pay special attention to. Make sure the ghostwriter will be able to capture your voice, or the voice of your blog posts (if you have a blog). Don’t take a negative approach to writing, even if this is your first time. To make it easier upon yourself, you can try recording yourself. For example, imagine that you’re speaking to another person, sharing all of your knowledge with them. Choose a chapter from your outline, or start with the first one. When you’re done, transcribe what you’ve written (which you can also do by hiring someone to transcribe for you, or use software that converts audio to text). What you will get will be very close to a first draft. After that, it will be easier for you to complete the first draft and move on to the editing process. During the writing process, you will need two things: access to your outline and access to your research. Again, Scrivener can be very useful because it allows you access to both of these very easily. You can know, at a glance, what you have written up to a given moment, and what is still left to write. Also, all of your research will be easy to access, so you will never have to lose time looking for all the information you need. Often, writers find it difficult to continue writing when they’ve spent more than an hour looking for one bit of information. However, keep in mind that some writers find Scrivener distracting. With the ease of access, you can easily get distracted with all the options and different settings. The best advice we can give you on it is to try writing with Scrivener on a test trial – if it’s too distracting, if you don’t understand how to use it, if it’s not working out as best as it could, then it might be better for you to write in Microsoft Word, or Evernote, or use another software that does work for you. As we said previously, you can set up a schedule to keep the process of writing your book constantly moving forward. The schedule, however, should never be overconfident. When we say schedule, however, we don’t mean how many words you will write in a day – that’s what milestones are for – but we talk about the overall schedule of publishing your book. First of all, your schedule must include the time it would take to write the description of the book, come up with a good title, and get a good cover. Broadly, you need to define when you will be done writing the book, how long the editing will take, as well as whether you will get a beta reader before publishing the book. All of these things can take time, so having a schedule can be the push you need to get all of them done. Again, please remember to keep the schedule realistic and open to modifications. If the writing process gets done faster, then move on with the editing process and the other tasks because you never know where you might encounter a problem that will cause delays. The average length, as we previously said, of a nonfiction book is around 50,000 words. If you decide to write 2,000 words per writing session (or per day), that’s around 25 writing sessions, assuming that you’re able to write 2,000 words in each session. That’s 25 days. You can plan that your manuscript will be finished in around 4-5 weeks. If you plan to have come up with a title within the same time frame, then you can plan the editing process. Let’s assume that you take a week away from your first draft and then spend two weeks editing your book. That puts you at around 7 weeks. If you plan to get a good cover of your book in the same period, and writing your professional author’s biography, then, ideally, from the moment you start writing your book, until the moment you publish it, 7 weeks would pass. The example is very optimistic. The writing process is very unpredictable, so the best thing to do is to add a few weeks for unprecedented situations. That still puts you at ten weeks to finish your book. The one thing left to do is to think of the market. You may finish your book in 10 weeks, but should you publish it immediately? Yes, you should publish it immediately if you already have a fan base to fall back on who will buy your book. If not, then you need to plan it by season. For example, summer recipes will not be popular at the end of summer, for example. Additionally, your travel guide for the world’s coldest places might not be as popular during the summer, when people usually go on sunny vacations. Again, research the market and notice when the books in your niche are the most popular and most sought by the readers. Then, decide on when you’re going to publish. If you want to publish your book by Christmas, and start writing in March, that gives you a lot of time to prepare your nonfiction book as best as you can for publication. However, if it’s June, and you’re writing a nonfiction book about having the perfect vacation, then publishing the book in late September or October is not very useful. Better wait for next year and publish it at a moment when you know people will be looking for the solutions you provide in your book, rather than just putting your book on the market. These milestones will refer mainly towards writing and the amount of words, at the beginning, but later on, they will also refer to the editing process, formatting, getting a good cover, and the rest. For starters, though, you will need daily or weekly milestones where you will decide upon either the number of words or the parts of your outline you will cover during the day or the week (or the month). You can go either way. For example, the average length of a nonfiction book is around 50,000 words. If you decide on a daily milestone of 1000 words, then you will have your manuscript written in about two to three months (you need days off, right?). Or, you can decide to split your book into chapters and set a word limit for each chapter to keep each chapter at the same length. The truth is, however, that this isn’t always possible. The length of the chapters will depend on how much information you have, not on how many words you can write. Even in a novel, chapters are not the same length, and some writers even write chapters as short as one sentence. So, if you’ve decided to write each chapter in 3000 words, what happens when you have so much information that it’s closer to six thousand? Or, what happens when you have shared all the information in just over 1500 words? This is why you need to keep everything flexible during the writing process. On the other hand, a daily goal of 1000 words might be too much for you, especially at the beginning. The good news is that the more you write, the better you will become. As such, your early milestones might be as small as 500 words per day. But as you slowly get into the habit of daily writing, you can start increasing that number to 750, 1000, 1250, and so on. Or, you can log the number of words you write every day and keep a weekly tab. You can plan to write one chapter in one week, for example, or to plan which part of your book you will work on during the week, and whether you will be done by the end of the week, or continue during the next week. And whatever you do, always ensure that you plan a day of rest. Writing can be a glorious process, but it is also a tiring one. If you overdo it, you might induce writer’s block. On the other hand, if you take many days off where you will not write at all, you might find it difficult to start again. Balance is the key, especially when it comes to long term projects such as writing a book. Depending on the topic of your book and the problem it solves, additional items like images, illustrations, tables and similar items might be a necessary addition. For example, for travel guides, images are a must. However, if you’re writing a self-help book, short illustrated comics (bonus points if they are humorous) are the better option. Another example is gardening. Explaining a planting process, for example, will go better if it’s illustrated. But if you want to show the results of said planting, an image – a photograph – will be the better option. Tables and graphs can be very dry and take the readers away from the experience. You should include these only if they are strictly necessary to round up your content. If not, they are better replaced by infographics, if you can include them, or comment boxes with specific information. They are relevant and useful. They paint a better image of what you’re trying to convey. They are not breaking the flow. The last of these is very important. For example, humorous comics of real life situations are best put at the beginning of a chapter. Then, the readers can go on and read the rest of the chapter with the illustration in mind – and understand it better as a result. However, if you put it in the middle of your chapter, or at random, the flow of the content will be broken. Your readers will get distracted by it – or they might even skip it so as to not to get distracted. In any event, the illustrated comic will not be useful at all. Images, on the other hand, can be placed throughout the chapter, as long as you reference them properly and provide a description for each image. They can enhance the reading experience and add an additional emphasis to a particular paragraph. In the end, every image or additional item that you wish to add should be viewed through the readers’ eyes. If you get distracted by the image during the editing process, then you need to change its position. Style is important because the wrong style can break your book. Instead of a best seller, you will have a book most readers dislike. For example, if you’re writing a self-improvement book in a writing style that is very strict and diminishes the readers, your book will not gain popularity points. Moreover, you might think that your ideas are original, however, it’s safe to assume that other writers have also thought of the same things and presented them in their books. This is where style comes in. Style is the manner in which you will present your content. Will you use the four senses and paint a picture in the readers’ minds with your words, or will you just present the information in a dry, nearly academic manner? What can you do to enhance the content? Start with your content: does it require an upbeat, positive tone, or a more tender one? Can you include humor? A funny anecdote will engage the readers, especially if you can use the anecdote to make a point. Sharing personal stories and experiences from your life is always positive. It will let the readers know that the book was written by someone who is very passionate about their work. When it comes to structure, it’s important to keep the content flowing. Read your first draft, or give it to a friend to read and ask them for feedback. You need to determine if the content flows. For example, a how to book, or a guide, will have steps to follow, with each step preceding the next, as is the case with this guide. For example, if we started with part three, which is the editing phase of publishing a book, and then went around to explain that first you need to plan your book, and then write your book before you get around to editing, it would disrupt the flow, and confuse the readers. Most readers, in that case, would skip the editing part and jump to the writing part, because that’s the part that readers want to read the most. Sometimes, a nonfiction book can read like an anthology of short stories – interesting to read, but not really connected by a single thread in a continuous way. In the case of fiction, the short stories in an anthology are connected by a theme, and presented in a way that flows. You need to do the same with your nonfiction book. Let the content flow in an organic manner, with one lesson, one piece of information leading, or somehow preceding what comes after it. Don’t make your readers compile your knowledge in order to understand it. Guide them through the journey of learning, from start to finish. The third phase of the process of publishing a nonfiction book is just as important as the other two phases. When you finish your first draft, you will discover that you don’t love it. You might even hate it, a little bit. This is where editing comes in. Sure, your first draft might need a lot of work, however, and you might even find yourself unable to edit your own work. Our advice is to always try. You can learn how to edit your own work through many different guides, and once you understand the basics of editing your book, you might find yourself enjoying the process. And the editing process can and should be enjoyed: because you will be putting in the effort of making your first draft into a fully formed manuscript. And all of the changes you will be making will turn your book into a truly enjoyable read. In fiction, it’s always better to take some time off after finishing a first draft to let your mind relax from the effort of writing the book. We advise the same for nonfiction. Yes, you put in all the effort into writing your book, and you want to get it out as soon as possible, not take a week off from the book, but taking a week off will allow your brain to detach from your writing. In other words, taking a week off will enable you to read the first draft with fresh eyes. And you will need those fresh eyes during the editing process. Preliminary edit is what we call the first round of editing your first draft. There will be more rounds of editing later. In the first edit, you will be looking for inaccuracies. We are all human, and it’s very easy to make a mistake (say, for example, that there will be five steps in a process, and then it turns out to be seven) that you did not remember to correct. The best way to do this is to print out your manuscript and sit down with a red or blue pen. Read through. Add comments on the margins of the pages to note changes that you can make, errors you need to fix, and most of all, improvements that you can make. Don’t be afraid to follow your gut – if you think that changing the structure of a chapter will improve it, then take the time and do it. See if it works or not later on. If you are going to do major changes, keep in mind that you should make another preliminary edit before moving on to the next round of editing. This way, you will ensure that all the changes are in order, and that there are no inconsistencies or errors. Editing on a grand scale is editing the now second draft on many levels. First level is chapters. Do the titles work, or not? Are they flowing in order, or are they scattered? Second level is paragraphs. You need to make sure that the paragraphs aren’t too long. You need to ensure they are concise and precise, rather than long and winding. Make sure the readers don’t get lost while reading them. During this round of editing, you also need to look for grammar errors. Read each paragraph carefully and make sure that the grammar is correct. Also, you can use software, like Grammarly, for help. Third level is sentences. Very long sentences, comprised of a lot of words, most of which are unnecessary and redundant, adding nothing to the overall meaning of the sentence, are a chore to read, and the readers will probably want to throw your book away if they are unable to follow most of your sentences to the end. So, find the long sentences and see how you can shorten them. Fourth level is words. Misspelled words, wrong words, homonyms and homophones, they are easy to mix and are easily spotted. Another thing you can look for in this level of editing is repetitive words. They are also easily spotted and can be easily changed to freshen up your content. Your manuscript is edited within a certain turnaround time. Your style fits your category, niche, and topic. There are no grammar and spelling errors or wrong words. Every other editing task is carried out except for the preliminary edit. A professional editor will also catch inconsistencies – however, to increase the chances that the editor is knowledgeable of the terms and words used in your niche, you can try to find a professional editor with experience in the same niche. But, since that might not possible, you should still go through the first round of editing yourself. This round of editing is dedicated to adding another layer to your writing. Instead of looking for errors, now you will be working on fixing them. The sentences that were too long and needed fixing, the repetitive words, and all the other errors should be corrected. The manuscript should now read a lot better, compared to the first draft. However, do not go overboard. Big words that most readers are unfamiliar with are fine if they are sprinkled within the writing, but if you use them constantly, it might have a negative effect – especially since the readers might not even know what some of them actually mean. Would you really want your readers reaching for a thesaurus or a dictionary in order to understand what you’re talking about? Because of that reason, your task is to find ways to convey the same ideas in fewer words, especially if a paragraph is too long, or if a sentence is too complicated. No, we are not saying that this is the time when you rewrite the manuscript completely in different words. What we are saying is to look for sentences that might take the readers out of the reading experience. You want to engage them, not take them away from your words. Beta readers are just that: people who will read your book and give you feedback on it, before the book goes through its final edit and gets published. Beta readers could be any people, friends, family members, or even some of your followers. Your beta readers should be looking for inconsistencies, errors in grammar or spelling, and repetitive words. In other words, they are doing the same as you, or the editor, only from the perspective of the reader. However, your beta readers should also give you feedback on the reading experience, and should give you their honest opinion. Ask them if they were able to connect to you as the author, whether they found your book helpful, and ultimately, whether they found the reading experience enjoyable. Remember your goal, which you set up during the first step of our guide, and ask your beta readers if you have achieved it. It doesn’t matter if the goal you set out for your nonfiction book was to help, to entertain, or to do both. From their feedback, determine whether that goal has been achieved. If not, you still have time to make changes. This is the final edit where you make sure that everything is perfect. You can do as many rounds as you need to achieve this. It’s important to note that after this, there will be no more changes. If you are self-publishing in ebook format, you can save the final edit as the last step before uploading the file. This is a grand edit where instead of looking for errors, you sit back and read your work and let the errors jump out at you. Since the manuscript has been well and truly polished, maybe even adjusted to incorporate beta readers’ feedback, you don’t need to look for errors and read everything thoroughly because even the smallest error will jump out. Many writers and professionals think that they can create a really good cover for their book. With a little knowledge of photo and image manipulation programs, they believe they can make a cover that will be attractive and original. However, nothing can replace a professional cover done by an artist. If you can afford it, get an artist to read your book and design a cover, or explain your book, content, and topic as best as you can. Tell the artist what you want to achieve, and let them design a cover. Trust us, an artist will create a better cover for your book than you would be able to, unless you’re an artist yourself. However, you must explain the topic to the artist as best as you can. You must let them know of your goal, of the problem you’re trying to solve, and what the content represents. You will ensure that the artist is able to grasp that on the cover. The biography must include your experience on the topic. If it’s healthy food, talk about how and when your life changed when you began using that specific diet. Where you studied and learned what you’re presenting. How long you have been writing on your blog. Your website and ways to reach you on social media. Your biography also needs a professional photograph of yourself, of course. In addition, make sure to keep your biography short and sweet, rather than longwinded. In exchange, you can write an afterword. In the afterword, you can combine the acknowledgements with the story of how the idea for the book formed in your mind, and how you developed it. If you do an afterword, it will have an even bigger positive impact on the readers because you will let them know what was happening behind the scenes, and how long it took you to write the book, and what the journey of writing a book has been like for you. This will endear you to the readers, and inspire a sense of familiarity with them, which is very important for writers and authors. If you are going to be using specific data, case studies, and other information from other sources, you need to credit them and mention them at the end, especially if you are using information from academic journals and publications. However, this step can be skipped if you are not using any information from outside sources and if the topic doesn’t require it (like humor). The publishing process of your nonfiction book will be out of your hands if you’ve landed a book deal with a publishing house. This means that you will have no control over the price of your book. Depending on your book deal, you will either get an advance, or be paid when the book is published and starts selling. The publishing date is also determined by the publishing house. So, you might have wanted to publish your book before Christmas, but the publishing house might set up the publishing date later. When you’re self-publishing, you have control over everything, from price to publication date. There are many online platforms for self-publishing. Some of them are owned by Amazon, like CreateSpace and Kindle Direct Publishing (KDP), which allow you to submit an eBook from anywhere in the world. CreateSpace even enables you to publish in print. Then, there is iBooks (iTunes), Nook (Barnes & Noble), Kobo, and Draft2Digital – which retails to the previous three and other, less-known platforms. You might need to pay for your ISBN if the retailer asks for it. Amazon (KDP) doesn’t need an ISBN because it assigns an ASIN (Amazon Kindle catalogue number). An alternative solution which you could consider if you’re not confident with self-publishing by yourself, and if you have the budget to do so, is to work with a self-publishing company to take care of the process for you. Promoting your book before its release can be done on your blog. You can also participate in book tours, especially book tours in your niche. Also, make sure to promote your upcoming book on social media with little snippets and funny comments. It helps create a buzz and ensures that many prospective readers know that your book is being published soon. You can do a cover reveal some time before the publication date. Also, make sure that you have an available excerpt on your website, as well as small paragraphs that are very relevant to the content. As for promotion after you’ve published your book, think about what you can offer. For example, can you offer seminars, webinars? Are you attending any events in different areas, or can you create a community or a forum on your website for your followers? The period after publication is all about interacting with the readers, to create a relationship with them and to set up your position as an expert in the field. You can use different tools to promote your book. For example, you can set up a free webinar that anyone can join. During the webinar, share some of your knowledge with the audience, and let them know that they can learn even more from your book. Or, you can do it the other way around. Your book could prompt your readers to go to your website and check out the free (or paid) courses and webinars, which you can use to promote your book further. Moreover, you can make more sales from the courses or webinars, if you choose to price them. These types of activities will ensure any reader that you are very knowledgeable in the field, which ultimately, will prompt them to buy your book. We’ve come to the end of our short guide on how to write your first nonfiction book. The first book is always difficult, for any writer, and once you’ve done it once, the next one will be easier. At least, you will have experience of the process, and you will find ways to make it easier upon yourself. Another thing you can do is to prepare as best as you can for the writing of your nonfiction book. There are a lot of tips and tricks that you can use in your writing, a lot of different ways to present your information, and the more you learn, the better you will get at writing. Always, write more to get better. Don’t forget the opportunities that having your first nonfiction book published offers. If you manage to carve up a space in your niche, now you have the perfect platform to fall back on for your next book. Many nonfiction writers keep writing within the same niche, answering problems and questions, or just viewing a problem from a different angle. You can do the same. With each book, you will offer more knowledge to the readers, and your relationship with your readers will grow, as will the number of your followers. When you have published more than one book, the readers will be more inclined to buy your books even if they are not following you on social media. However, in order for that to happen, you need to start with the first book. The first book will become the pillar of your professional career. As such, make sure that you do the best you can to make it the best version of yourself. It will be, after all, how you introduce yourself to the world. Need a publishing house for your nonfiction book? Be sure to check out our list of 21 Top Nonfiction Book Publishers Accepting Submissions. The Ultimate to Guide to Writing and Publishing a Nonfiction Book is an article from Writing Tips Oasis. Georgina Roy wants to live in a world filled with magic. As an art student, she’s moonlighting as a writer and is content to fill notebooks and sketchbooks with magical creatures and amazing new worlds. When she is not at school, or scribbling away in a notebook, you can usually find her curled up, reading a good urban fantasy novel, or writing on her laptop, trying to create her own. Fantastic article 🙂 Very detailed and useful. I shall be passing it on to my friends who are looking to write their own books.